Type 'Easter' into an Internet search engine, or read about it in any number of popular mainstream or pagan press books, and you will find reference to the goddess Eostre or Ostara after whom the springtime Paschal (i.e. Passover) festival 'Easter' is named. These potted histories tend to contain a number of speculations about the goddess, often presented as 'fact' with no references to the sources of information. This article is an attempt to separate historical fact from modern mythology. What primary historical sources do we have that mention the goddess Eostre? In olden times the English people - for it did not seem fitting that I should speak of other nations' observance of the year and yet be silent about my own nation's - calculated their months according to the course of the Moon. Hence, after the manner of the Greeks and the Romans, [the months] take their name from the Moon, for the Moon is called mona and the month monath. It seems probable that Bede would have encountered people who, if not heathen themselves, had heathen parents or grandparents and knew something about pre-Christian Anglo-Saxon gods and rituals. And it's unlikely he would have any motivation for 'making up' a pagan goddess. Thus, there is no obvious reason to doubt what he has to say about Eostre. So what does Bede say about Eostre? Eosturmonath has a name which is now translated 'Paschal month' and which was once called after a goddess of theirs named Eostre, in whose honour feasts were celebrated in that month. Now they designate that Paschal season by her name, calling the joys of the new rite by the time-honoured name of the old observance. That's it. Bede doesn't describe the goddess. He doesn't say anything about the feasts that were held for her. He certainly doesn't mention hares or eggs. In Teutonic Mythology, Jacob Grimm tells us that the Anglo-Saxon name Eostre is related to Old High German adverb ostar expressing movement toward the rising sun. "Ostara, Eostre seems therefore to have been a divinity of the radiant dawn, of upspringing light, a spectacle that brings joy and blessing, whose meaning could be easily adapted to the resurrection-day of the Christian's God. " Perhaps. But although Grimm's philology was probably on target, his comments based on it are nothing more than romantic speculation. 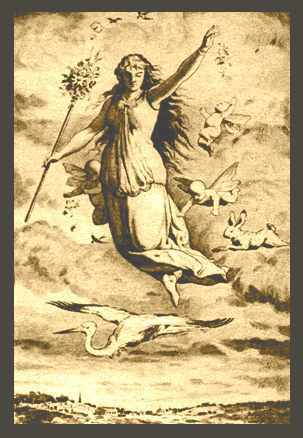 Eostre/Ostara could equally well be a goddess who, in the mythology of some ancient Germanic tribe, simply came from the east. Now that we know how little can be gleaned from ancient sources and philology, lets look at some of the modern myths being spread on the Internet and in the pagan and popular press. No Norwegian, Icelandic or other Scandinavian primary source mentions 'Ostara'. In fact, the name 'Ostara' isn't found anywhere in connection with a goddess. 'Ostara' is simply the Old High German name for the Christian Festival of Easter. Because the word is cognate with Anglo-Saxon 'Eostre', and because we have Bede's evidence that Eostre was a goddess, Grimm concluded that "This Ostara, like the Anglo-Saxon Eastre, must in the heathen religion have denoted a higher being, whose worship was so firmly rooted, that the Christian teachers tolerated the name, and applied it to one of their own grandest anniversaries." The theory that ancient Europeans worshipped a single 'Great Mother Goddess' has long since been rejected by academics but continues to be spouted in popular books. (Read The Myth of Matriarchal Prehistory if you want to explore the political reasons behind this.) But go back to the only historical source on Eostre quoted above. It's rather difficult to get from what Bede tells us to 'The Great Mother Goddess' without huge leaps of wishful thinking. According to various popular sources: Eostre has a hare familiar/totem animal; Eostre can take the form of a hare; Eostre has the head of a hare. There are associations in English folklore between hares and the Christian festival of Easter. For example, in 17th century Southeastern England there is evidence of a custom of hunting a hare on Good Friday, and in 18th century Coleshill there was a manorial custom in which young men tried to catch a hare on Easter Monday. There is no reason to believe that such customs go back to pre-Christian times. The Oxford Dictionary of English Folklore bluntly states: "Nowadays, many writers claim that hares were sacred to the Anglo-Saxon goddess Eostre, but there is no shred of evidence for this." The Easter egg is often said to be a symbol of Eostre and this 'fact' is used as 'evidence' that Eostre was a fertility goddess. According to the Catholic Encyclopedia, "Because the use of eggs was forbidden during Lent, they were brought to the table on Easter Day, coloured red to symbolize the Easter joy. This custom is found not only in the Latin but also in the Oriental Churches." Eggs would have been in abundance for Christian communities at Easter time because the hens would have continued laying throughout the preceding forty days of fasting during Lent. The embryonic symbolism of new life also happened to tie in well with the Christian theme of resurrection. According to some Neo-Pagan sources, these were originally offerings to Eostre, with the cross representing either the four quarters of the year or the four quarters of the moon. As the symbol of the 'cross' is the central focus of the Christian Easter celebration, I shouldn't have thought there was a need speculate about alternative explanations. Bede certainly has nothing to say on the subject of pagan pastry. So far I haven't actually come across a source claiming that chocolate is sacred to Eostre/Ostara, but as it is strongly associated with Easter in most people's minds, I wouldn't be surprised to come across that 'fact' in a tabloid newspaper or Pagan website article on the history of Easter. The modern mythology that has sprung up about Eostre over the past 30 years or so fascinates me. A lot of non-Christians (whether or not they identify as 'pagan') enjoy family customs such as dying eggs, baking hot-cross buns, reading stories featuring the Easter bunny to their children, going on egg hunts, feasting on lamb and consuming far too many chocolate eggs. They see Easter as a celebration of spring as opposed to a celebration of the crucifixion and resurrection of Christ. And yet they seem to feel a need to associate these customs with another deity - one who, for them, is the embodiment of springtime. Perhaps Eostre herself has somehow encouraged these associations. Perhaps, after having her original heathen festival hijacked and her name applied to the festival of a foreign god, she has decided to use the same tactics in return - reinterpreting Catholic Christian symbols and customs as her own. In my own heathen tradition, we see Eostre as a joyful goddess associated with spring and new growth - not because we read that anywhere, but because that's how she comes across to us. We celebrate Eostrefest in April on the first weekend after the bluebells come into bloom. We always hold this festival outdoors in woodland, no matter how rainy or muddy. We have a wooden statue of Eostre which takes centre stage on an altar. Next to it is a plate of seeds. We start with everyone making food or drink offerings to the wights of the wood. Then we welcome Eostre and give her an offering of mead - splashing it on her statue. We ask the wood wights to bless the seeds for us, so that we can remember them and honour them throughout the summer. All participants bring an eggcup. We fill these with mead, and then ritually bless them. Everyone simultaneously tosses the mead up in the air and yells "Hail Eostre!" - with the goal of getting as much mead raining down on others as possible. Next we fill a horn with mead and have a round of toasts to Eostre, spring and new growth. Afterwards we feast (picnicking if the weather permits). Decorated hard-boiled eggs as well as chocolate eggs tend to be on the menu. I very much doubt the heathen Anglo-Saxons honoured Eostre with eggcups. I very much doubt they had eggcups. But all who attend our Eostrefest seem to feel that the goddess approves - and that she gets a kick out of watching us soak each other in mead in her honour.